The past few nights have been pretty rough around here. Needless to say, I am all tuckered out. I could really use a nap. Miss Lilli has decided that her crib is party central from 3 am -6 am. Swaddles are being busted out of, arms are flailing and babies are shimmying all over the place. It's the place to be. Unless you're me, and you want to be in dreamland, my only respite from mommy chaos. Sigh. Thank goodness for my coffee maker, programmed for 7 am. I can sit bleary eyed and try to get prepared for my day before #1 wakes up, demanding her orange juice and mini pancakes. My tiredness makes me want to give up any dieting efforts I have been attempting. I have been having this recurring dream about a really fluffy banana cake frosted with chocolate and sprinkled with walnuts. Sad to admit,m I do dream of food. Where did this cake come from? I swear I remember eating it in my youth, but my mom said she never made such a cake. I will have to make an attempt, next time the bananas are past their prime. 8 Responses to tales from the nursery…. 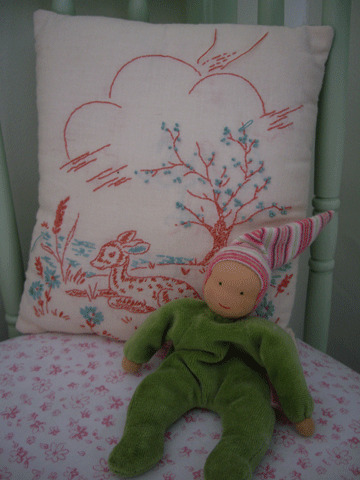 I adore the pillow in the picture- did you make it? On another note, I can very much sympathize with the baby party going on. Sleeplessness makes it all even harder. It will get better- my two are 7 and 9 and they can get their own breakfast which is fabulous. I promise it will get there for you too- However- the cute-ness factor is all but gone on my boys, and seeing your adorable little girls makes my mommy hormones go nuts! They are darling (I know it’s hard to remember when you’re exhausted) Hang in there! Hang in there and toss the diet I say! Just eat everything you like but in tiny portions, like the French do,and you will be doing great. I love the colors in that pillow, very sweet. oh i bet that would be delicious! just have it! you deserve it! and that pillow…oh my…that’s beeeyootiful! mmm..banana cake sounds like divinity! god love anything banana, though im not fond of eating the fruit itself…bad visuals maybe? Great idea with the coffee maker – we have to start using the program mode. I remember those days well (because they were just a few months ago) and with every milestone (new words, new physical ability) it seems we’re up at 2:00 am all over again. ok, you make the cake & I will come share it while both our 2 little ones have play time in the cribs! I have one of those teething right now. Three teeth turned up in the last week so I understand but still, the lack of sleep is getting harder to handle & impacting on sewing time a little!